Strobelights, Super Smash Brothers and 167,200 yards of swimming dominated the campus pool for 24 hours on Oct. 1 through Oct. 2 as the UC Santa Cruz swim team hosted their 12th annual Ian W. Carney Memorial relay fundraiser. For the team, the 24-hour relay is the main fundraising event of the year, and the members reach out to friends, family and alumni for donations via pledge forms. Their annual target is at least 85 miles, but this year they totaled 95 miles, only one mile shorter than last year. The total amount raised has not been calculated yet but is likely over $12,000. 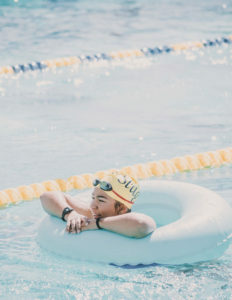 As the hours pass, the team members swim as many yards as they can with breaks for goofing around, bonding and staying sane as the day turns to night. During the 24-hour period, some team members set up sleeping areas to catch a little rest during breaks, though once they woke up, the general attitude was begrudgingly excited. Fundraising makes up about half of the swim team’s annual budget and allows them to take more than 70 members to the Pacific Collegiate Swim Conference conference each year. This year they will go to Los Angeles to compete in February. The 24-hour relay became the staple fundraiser for the team after they decided to stop their previous fundraiser in 2012, which was a relay-style swim across Monterey Bay. “During the later years of the bay swim, we started running into a little bit more wildlife than we wanted to run into,” Nauman said. “Like a 21-foot great white [shark] that wouldn’t go away,” added head coach Kim Musch. During the 26-mile bay swim, the team encountered jellyfish in years when the water was warm, and would sometimes be covered head to toe with stings. Though some alumni are fond of the bay swim, the transition away from it has allowed the whole team to participate — previously only 12 swimmers swam across the bay due to the limited boat capacity, and because of this it was usually only third and fourth years. Since 2012 the team has hosted the pool relay and divides the now 85 plus miles among the swimmers. Throughout the 24 hours, the team messed around with surfboards in the water to stay entertained while completing the many laps. In the later hours of the night, cool temperatures set in, presenting another challenge to the team. target. They band together and support each other, cheering from a hot tub and taking photos. Raising enough money through the 24-hour relay to fund the trip to conference is the goal of the fundraiser. Last year it cost around $17,000 for hotel and transportation fees, Musch said. This year the fees will be about the same. The men’s team came in second last year out of six schools and the women’s came in eighth out of the 10 schools there. As the season winds down, the team begins to reduce the distance they practice — an endurance strategy known as tapering — in order to maximize their rest and performance as the event nears. This year is no different, and the team is already looking ahead.